She always look pretty, she’s just like a rose! The dresses are gorgeous, rare and mint! Is she happy, this queen of domesticity? Is it what she dreamed of – this life? Hats off to the missus, at least she’s faultlessly dressed! Dinner has been planned. 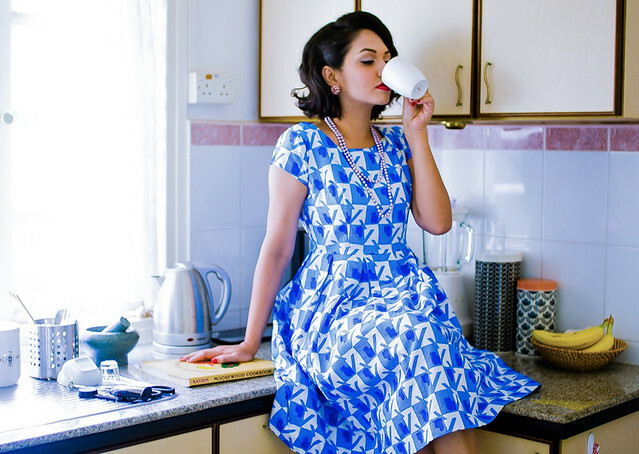 She sips tea on the kitchen top in a bright and cheery graphic print 1950′s dress in blue and white. Adorable 1950′s cluster faux pearl earrings on her ears, and a faux lilac pearl beaded necklace looped twice around her neck. Well, there’s no use crying over spilled milk! 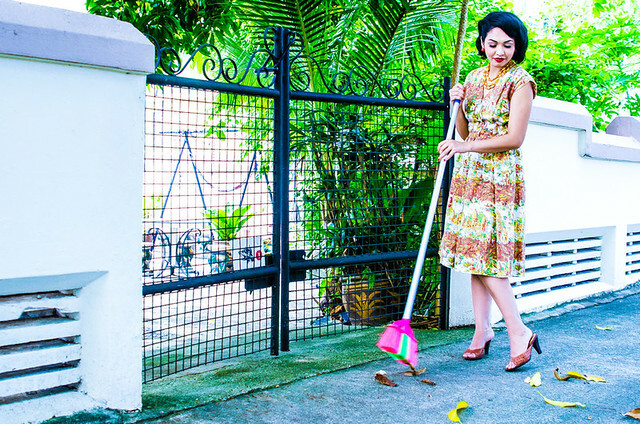 She mops up the mess in a dark pink 1950’s dress with cut-out accents on the sleeves and pockets. 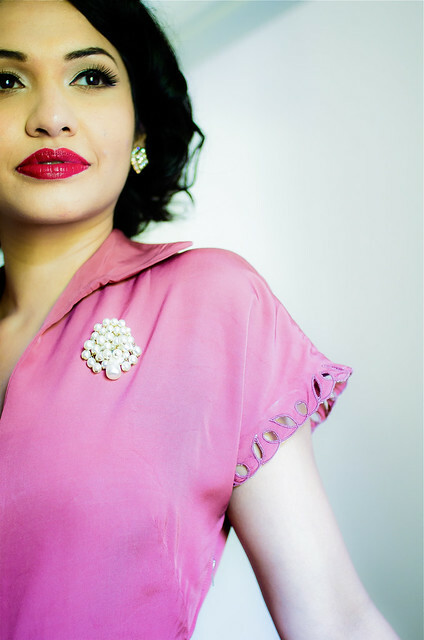 1950’s dark pink dress with cut-out accents; 1950’s faux-pearl cluster brooch; 1950’s square aurora borealis clip-on earrings. 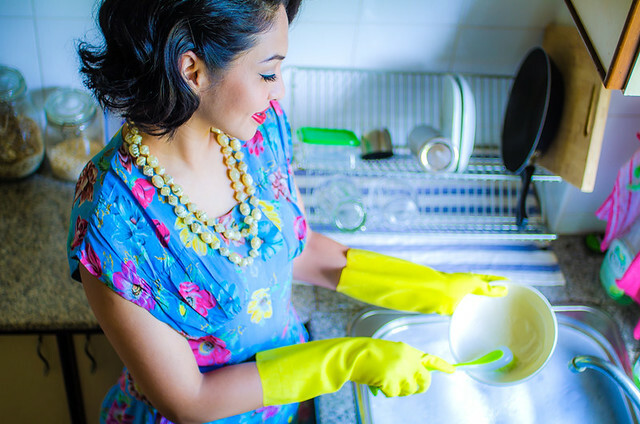 Immaculately dressed while washing the dishes! 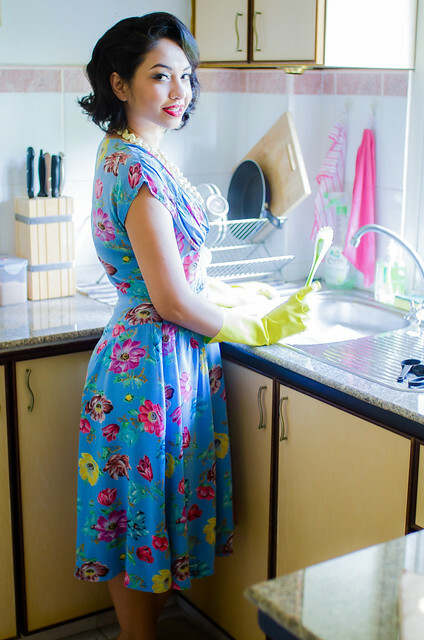 Here, the Queen of Domesticity washes the dishes in a lovely and flowery 1950s dress. Sweet and feminine 1950’s floral print dress with slightly gathered sleeves and bodice; Cream 1950’s Bi-strand beaded necklace. Uh-oh! We hope she’ll find a way to remove that burn mark! 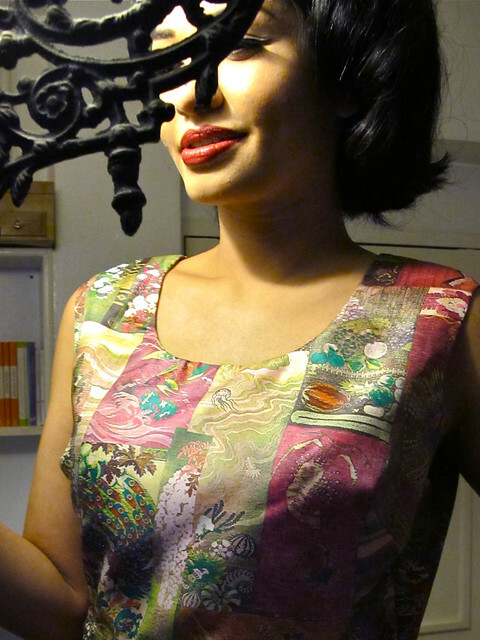 But never mind that – show off your hourglass figure in this mesmerizing 1950′s graphic print dress! The tri-strand ombre-tone 1950’s faux pearl necklace adds flair to this 1950’s graphic print dress with an ascot-tie collar. 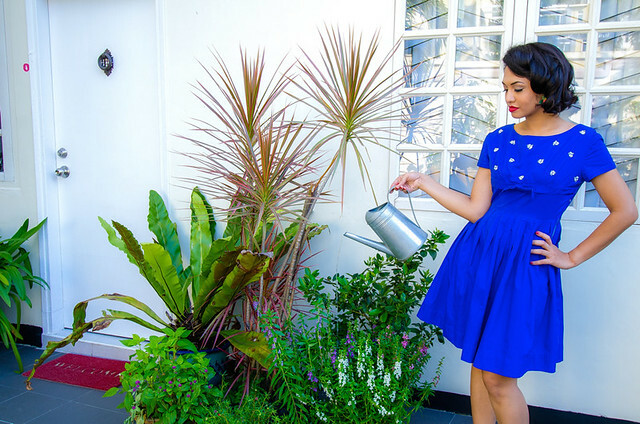 She’s got a green thumb: Gorgeous blue 1950’s dress with little white embroidered flowers, a pleated skirt, and a sweet little ribbon accent on the bodice. 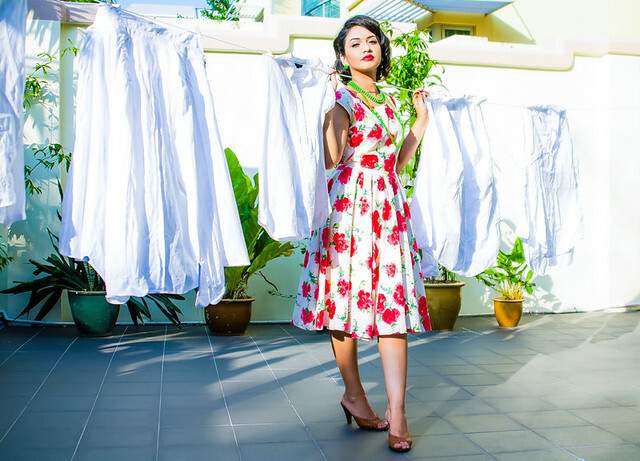 Spring is in full bloom: She hangs the laundry in this absolutely divine 1950′s dress with vibrant floral blooms. Around her neck, a bright green beaded necklace matches her equally bright green round earrings. There’s always so much washing to be done! Cleaning the scooter in style, wearing a 1950s light grey dress with pretty ribbon prints. How’s the lipstick? We love the rows of pretty ribbon prints on this 1950s dress. 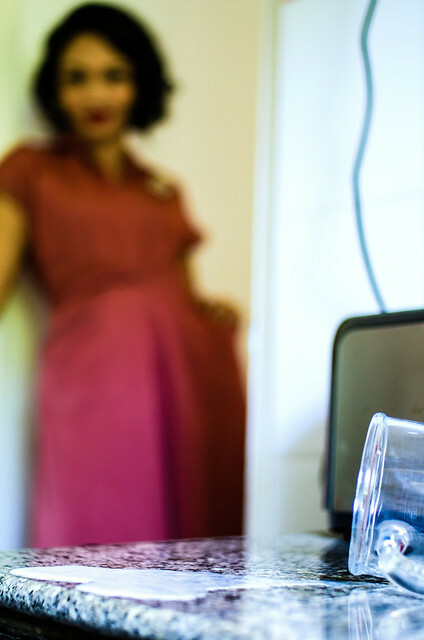 A pair of dangling 1950s multi-coloured faux pearl earrings adds oomph to the outfit. On her finger, she wears a brown and cream cameo ring. The fabulous prints on this 1950’s dress depicts an exotic land in the far east, complete with temples, fishermen in conical hats, and dancing women in traditional costumes! 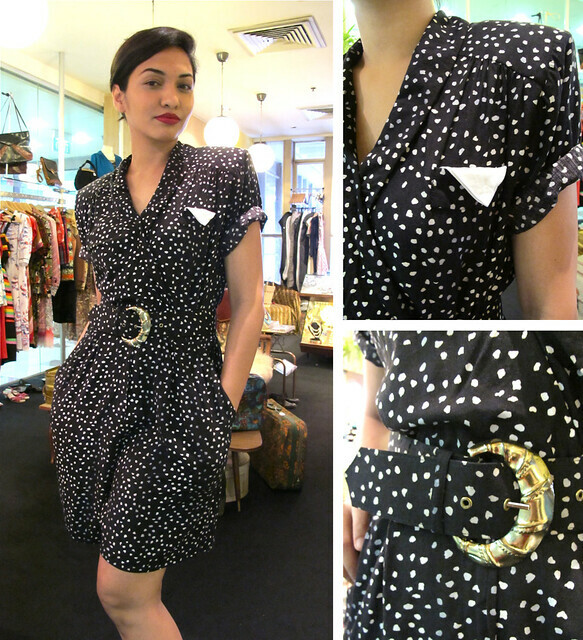 This 1950s novelty print dress will sweep you off your feet! 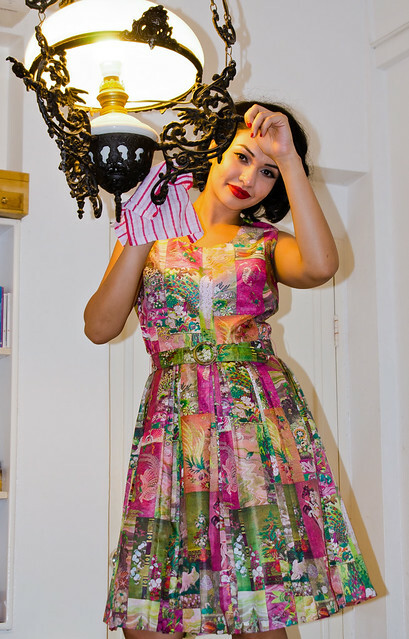 She’s shining bright in this unusual 1950’s dress with interesting exotic prints, comes with a matching fabric belt. We spot prints of jellyfish, lobsters, crabs, horses, peacocks – just to name a few. Exhausted but still looking glamorous after a hard day’s work; 1950’s off-white floral dress with delightful hand-drawn-like butterfly prints. A green and orange Bi-strand beaded necklace from the 1950’s adds interest to the outfit. There’s so many details we love about this dress – pretty floral prints, stripes of varying widths, the darker brown pattern on the lower sleeves and skirt, the funky pointed collar, and the cute round brown buttons! Worn here with a slim brown leather and fabric belt. 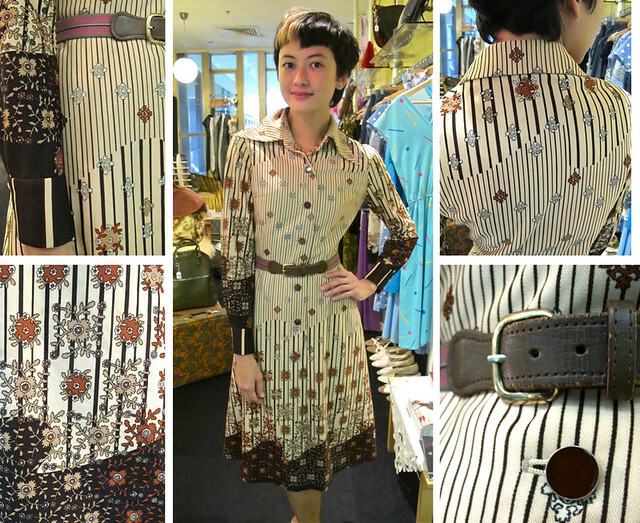 We love a good novelty print, and this lovely dress from the 1970s is a fine example! The quirky combination of stripes, polka dots and bright blue silhouettes of birds and trees makes this dress unusual and unique! 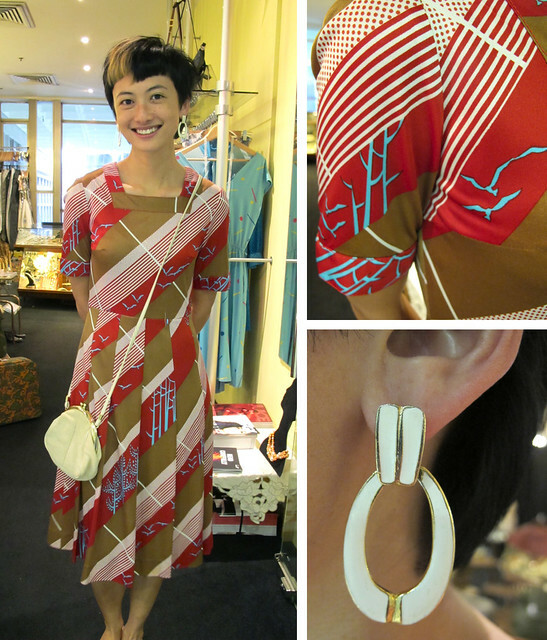 Worn here with a cute beige fabric sling bag, and 1970’s cream enamel earrings. Wow ’em with this awesome romper with a shirt front, fake front pocket white hanky, don’t-mess-with-me shoulder pads and its own polka dot belt! A very smart looking romper!